InterSystems IRIS provides object technology by means of the following object classes: %Library.RegisteredObject, %Library.Persistent, and %Library.SerialObject. A persistent class is automatically projected to a table that you can access via InterSystems SQL. The following chapter discusses persistent classes in detail. Via the classes %DynamicObject and %DynamicArray, InterSystems IRIS also provides the ability to work with objects and arrays that have no schema. These classes are not discussed in this book. For details, see Using JSON. As noted earlier, InterSystems IRIS allocates a fixed amount of space to hold the results of string operations. If a string expression exceeds the amount of space allocated, a <MAXSTRING> error results. The limit is 3,641,144 characters. You can use stream fields with InterSystems SQL, with some restrictions. For details and a more complete introduction, see Defining and Using Classes; also see the InterSystems Class Reference for these classes. If you prefer to work with classes, InterSystems IRIS provides list classes and array classes; these are called collections. If Classname is a data type class, then InterSystems IRIS uses the interface provided by %Collection.ListOfDT. 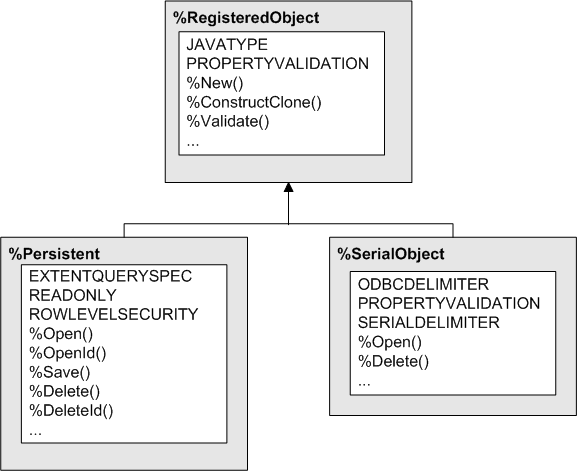 If Classname is an object class, then it uses the interface provided by %Collection.ListOfObj. If Classname is a data type class, then InterSystems IRIS uses the interface provided by %Collection.ArrayOfDT. If Classname is an object class, then it uses the interface provided by %Collection.ArrayOfObj.